When Valve released an update to its Steamworks platform last week to enable paid mods, I’m not sure it realized what kind of backlash could result. There’s been some incredible debate since the feature rolled-out, and it’s been fascinating to watch. Let’s dive in and take a look at this problem from a couple of different angles, shall we? Note: After this article went live, Valve pulled paid content from Steamworks. If there was ever any doubt that the game modding community is passionate, I think it’s been obliterated given the events that have transpired since Valve updated its Steamworks platform to allow the sale of mods. It’s not often in gaming we see a backlash of this scale, or one that manages to 180 the opinions people have on a company. 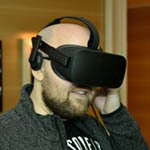 With the advent of the PC Master Race, Valve’s Gabe Newell has been heralded as the savior of PC gaming, a mindset that, for the most part, extended to Valve itself. Today, though, it’s difficult to predict how people will feel after all of this settles down. Up until the launch of Steam’s mod marketplace, it almost felt like Valve was invincible. While there were a number of faults people could have found with the company (customer service being a major sticking-point), it seemed like most were in favor. And it’s no wonder: it’s pretty hard to hate a company that regularly gives you the opportunity to purchase great games at incredibly low prices. That perk has long been one of the most-favored anti-console arguments, as even when games go on sale for Xbox or PlayStation, they rarely bring the “wow” factor that anyone who’s ever looked at a Steam sale has experienced. 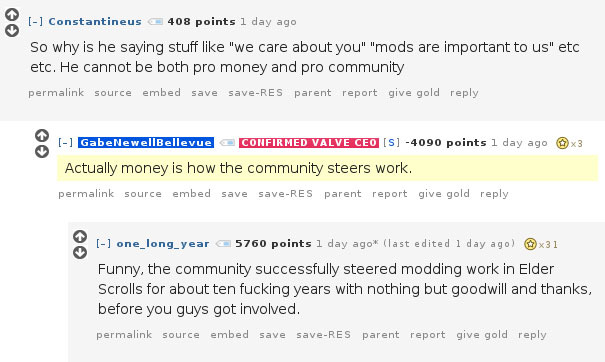 Yup – that’s the Gabe Newell with over 4,000 aggregate downvotes. It seems some did side with his opinion, though, as he was gilded 3 times (each gilding costs the gifter about $4). User one_long_year countered Gabe’s thought so well, though, that he scored nearly 6,000 aggregate upvotes and a staggering 31 reddit gold gifts. Remember that passion I was talking about? Later, another user commented that it’s been more like 20 years since modding has been available to the Elder Scrolls series, something that further proves that modding as a whole doesn’t need Valve’s help to flourish. Not that that’s a surprise, though. I have friends who’ve spend hundreds of hours modding Skyrim, and that was made possible because the modders wanted to share their creations with the world. These mods didn’t demand a purchase, even though some of them were incredibly complex. That’s not to say that the modders didn’t deserve payment, or even ask. Some ask for donations, and they certainly have their right. The lack of a donation option seems to be the biggest sticking-point gamers have with Valve’s implementation of its mod marketplace. Quite simply, many people agree that we should continue on as we always have, and I tend to agree. This isn’t a matter of whether or not game modders deserve to be paid, it’s more a matter of the fact that the modding situation has been great up to this point. 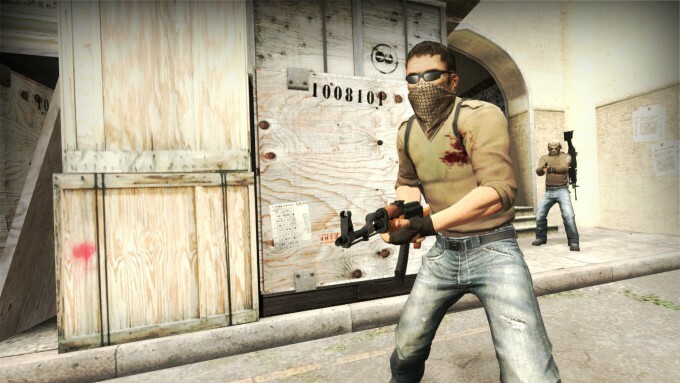 It also raises a major concern: could Valve’s move hurt game modding? Look no further than downloadable content to gain an understanding of what’s at risk here. When I purchased an Xbox 360 and Need for Speed: Most Wanted in 2005, I was surprised to see that I could purchase immediate access to better vehicles, right from the get go. Vehicles that are earned during normal progression, it should be noted. I believe that was my first experience with DLC, and looking back, I sure had no idea of what was to come. Nowadays, DLC is a common gamer gripe. It’s a little too rare when post-release add-on content feels like it’s worth it. For many, it feels like nothing more than the game developer / publisher trying to milk them as much as possible, until the next game comes out. Could there be a better example than Call of Duty? There’s no reason to believe that for-sale game mods won’t experience a similar fate. 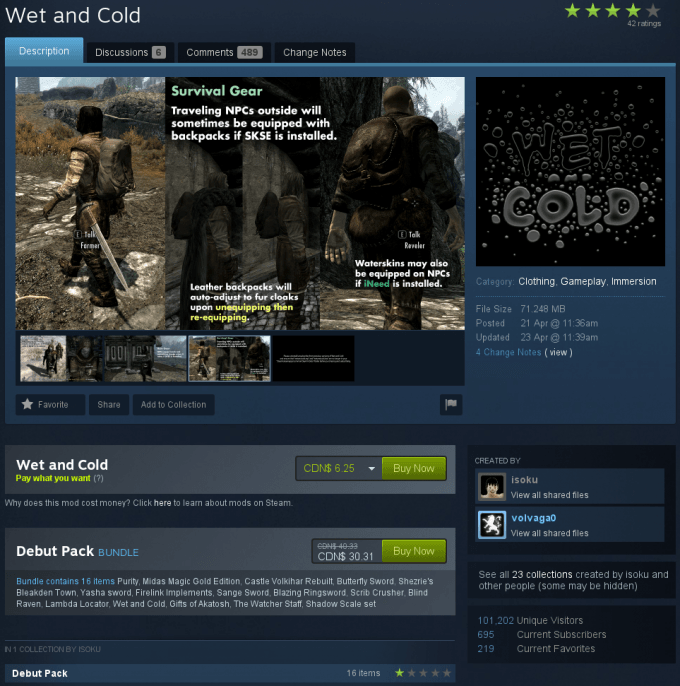 Even at the beginning of this Steamworks addition, the Skyrim mods available for sale have questionable quality, and not surprisingly, the mods Valve itself is promoting at this landing page are paid. Likewise, clicking “Browse Skyrim Mods” automatically filters out the free options. That speaks volumes. For some, reaching a definitive conclusion about paid mods is difficult. In general, I am not sure it’s a bad thing, per se, as if someone creates a quality mod, it seems fair that they could charge for it. However, in that case, it might be best to just go the donation route, because after all, while they created the mod, they didn’t create the game that enabled them to release it. It might seem reasonable, then, that a game’s publisher / developer gets a cut of the profits. If you pay for your hardware and software that helps create these mods, is it unreasonable to believe that the game’s developer would deserve its own cut? See? This is all so murky. Here’s another angle to make conclusions even more difficult to sum-up. A couple of months ago, Epic announced that Unreal Engine 4 was becoming free, and all the company asks is that if the work you create with its tools generates more than $3,000 per quarter, you pay a 5% royalty. That seems a lot more fair than Valve + Publisher taking a staggering 75% of mod purchase prices right now. If it was a lot more modest – or fair – simple mods wouldn’t be priced at $5. That of course wouldn’t solve the issue of the mods having a cost at all, though. Regardless of how this topic is looked at, it seems as though the bulletproof solution is to just remove the feature from Steam, and let things continue on as they always have. A second solution is to go the donation route. What I can’t help but wonder is if Valve would be facing this much flak had it launched its Steamworks update with any game other than Skyrim. As I covered earlier, some of my friends have spent hundreds of hours taking advantage of free mods for the game, so to come out of nowhere and begin encouraging people to charge for them is hardly ideal, to say the least. And some of these are not cheap. 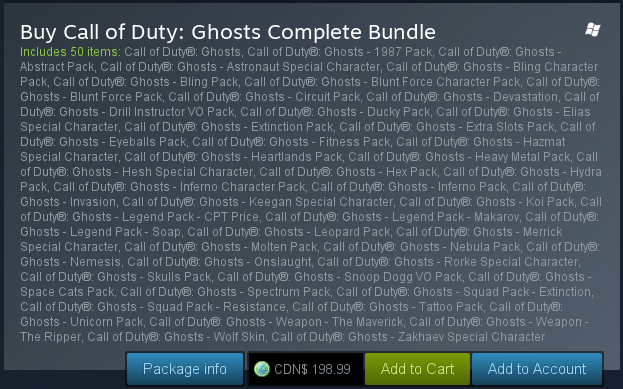 Coinciding with the launch, Valve prepared a “Debut Pack” bundle featuring 16 mods, totaling $30. Some great games cost that much at launch, and even quality add-on / DLC / expansion packs for games that offer actual content cost half that. I wouldn’t blame you if you found that to be a bit odd. Also of concern is that some modders have already begun charging for their mods that were previously free. One example is “Wet and Cold”, by isoku. This mod has been available at nexusmods for a while, and has amassed 1.13 million unique downloads. With this Steamworks launch, the mod’s developer has decided to make the brand-new 2.0 version exclusive to Steam, with the default price set to about five dollars. Interestingly, this is one of the rarer listings that actually lets you “pay what you want”, down to a minimum of $1. 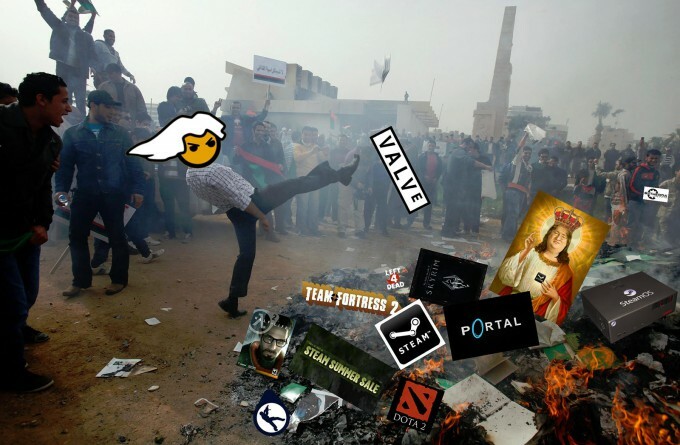 Since last week’s launch, one of the best sources of information has been the PC Master Race sub-reddit. A couple of threads that stood out to me most include one that highlights stores other than Steam to purchase games from, a new project to create “our” own launcher, and another that sees a couple of modders come out against Valve’s move. The ire extends well beyond reddit, though. A petition has been launched to help kill paid content on Steamworks, and currently sits at an impressive 130,000 signatures (with the goal being 150,000). And as if we needed even more fuel to pour on this fire, one Valve employee has reportedly said that Valve could be “completely wrong” about its move into paid mods. Here’s more food for thought. Without free mods, Valve could be an entirely different company today. Counter-Strike, Team Fortress Classic, Left 4 Dead, Day of Defeat, and Dota 2 all began their lives as free mods. Even Portal started out as a freely-available game. That sure is a lot of information to digest, isn’t it? It’s almost hard to believe that all of this has come about a mere four days after Valve rolled the Steamworks feature out. What happens from here-on-out is anyone’s guess. Based on Gabe Newell’s responses in his AMA, it doesn’t seem like he or Valve thinks that much is wrong with the company’s implementation. However, with this kind of backlash, it’d be hard to believe that the company wouldn’t make some change. If donation buttons were added in lieu of big green “Buy Now”, something tells me that Valve’s latest feature would have had a much calmer release.